A lot of people love jumping on very bouncy trampolines because of the feeling of weightless freedom it gives them. Brand new trampolines usually need time to get broken in before they're really very bouncy, so you may be interested in finding some tips on how to make your trampoline more bouncy until then. Luckily, there are a few ways to do this. To fully understand how to make your trampoline more bouncy though, let's take a quick look at what makes them work. If you don't have a trampoline yet or are looking for an upgrade, check our bounciest trampoline ranking below. 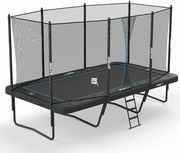 Do Trampolines Get Bouncier Over Time? Gives you a surface to jump on. 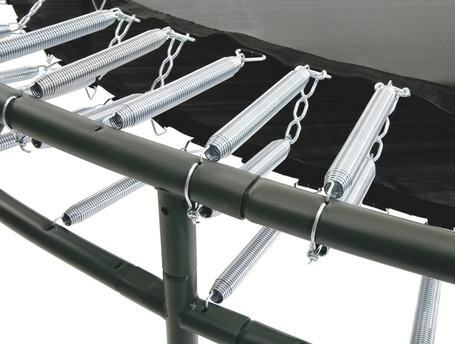 Connects all of the springs of your trampoline together. That last check point is where the real answer to your question lies. Trampolines get their bounce from the springs. Think of the springs on your trampoline as rubber bands. When you jump on your trampoline, the springs stretch out, storing your kinetic energy, and then using that kinetic energy to launch you back into the air. In simple terms, the springier your springs are, the bouncier your bounce is. This is a tricky question and the answer really depends on how old your trampoline is. 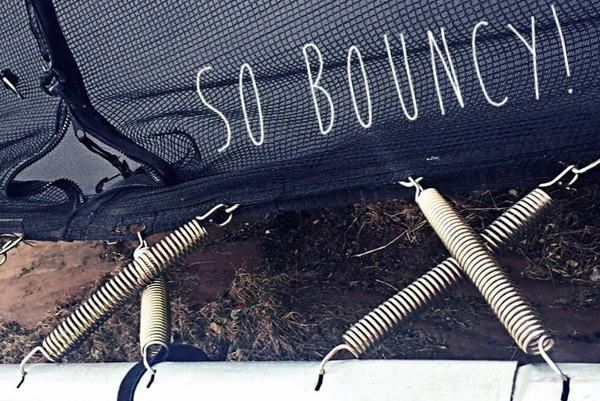 If your trampoline is brand new, then yes, you will notice more bounce over time the more it is used. This is because new springs usually take some wear and tear before they really start to get some good stretch to them. This also means that your springs may eventually need to be replaced as they lose their elasticity. Don't worry too much about this at first though. It takes a long time for your springs to reach the point that they need to be replaced, but that brings us to the opposite end of the spectrum for answering this question. If your trampoline is older and it's not quite as bouncy as it used to be, don't expect it to get better. You probably need to replace your springs. Lost elasticity - This is pretty easy to spot. If you've ever seen a slinky that doesn't recoil to its original shape because your kid has played with it too much, it's basically the same thing. There should be no (or very little) space between the coils of your springs. Broken springs - You'll need to check each spring individually for cracks or breaks. Even one broken spring can cause your trampoline to lose bounce, as well as pose safety hazards. 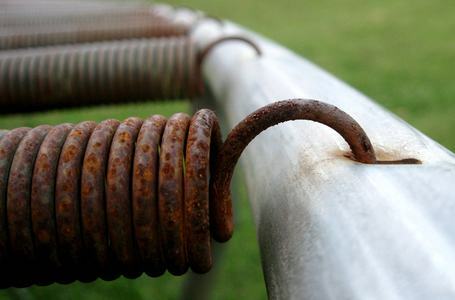 Discoloration or rust - Rust is usually a sign that your springs are probably not going to last much longer. It can also cause the springs to lose some of their elasticity, so you'll want to replace any rusted springs as quickly as possible. Whether or not you see anything here will depend on what you might want to try to increase your bounce. This is relatively simple, but can go a long way toward increasing your bounce. The best part about this method is you don't have to worry about buying any extra springs. Simply arrange the springs in pairs of two so they cross over each other, forming an X. This method also doesn't require purchasing any additional springs, although it can potentially cause your jumping surface to wear a bit more quickly. For this method, you'll leave each spring attached to its respective slot on the frame. However, only every other rung on the jumping surface is used. This means every rung that is used has two springs attached to it, creating a V-shape. This one is a bit more complicated and you may need to buy some extra springs to make it work but, in my opinion, this options offers the most bounce. Every third rung on your jumping surface should have three springs attached to it, with the others only having one. Additionally, the rung directly across from the one on your jump pad that has three springs attached should only connect to one spring. All of the other rungs on your frame should have two springs attached. When done correctly, your springs should create a W-patter, with an extra spring coming out of the crest of the W.
If you've inspected your springs and they're showing significant wear and tear, there's really only one good way to get your bounce back. Install new springs. New springs will take some time to break in, however, so you might want to consider crossing them, at least until they've gotten some good use. If you're replacing your springs or you've tried everything else and you're still not getting enough bounce, try getting some heavier-duty springs. The stronger your springs are, the more kinetic energy they can store and reflect back at you, which means more bounce for your jumps. 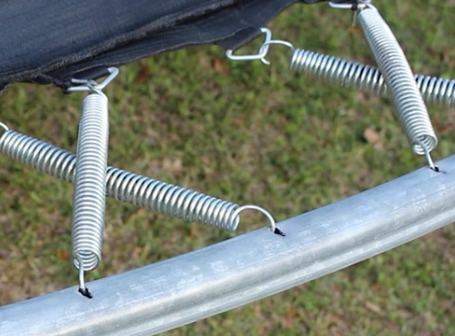 Finally, the more springs your trampoline has, the more bounce it will provide. 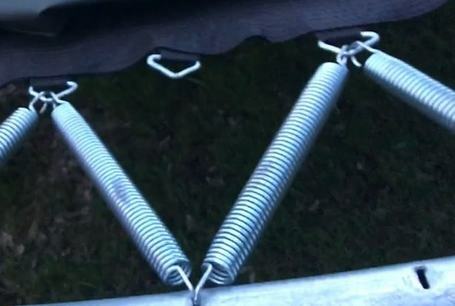 Some trampolines are specifically made to accommodate more springs than others, but if yours isn't made this way, you can still double your springs by using some of the spring crossing methods mentioned earlier. We all like a good jump on a very bouncy trampoline and it can be frustrating when yours starts to lose its springiness. The good news is, it's not gone forever and these tips on how to make your trampoline more bouncy should get you back up and running in no time flat. Happy bouncing and, as always, be safe!